Tan Wah Sing, local barefoot runner. He is a real fast runners. A simple search on youtube on "barefoot running" and its have a lots of video related to barefoot running. But i cant sleep back, im keep thinking of running, ok, dont care, im just went out to Bukit Aman Car Park. If still raining, then its my faith im not able to run today. 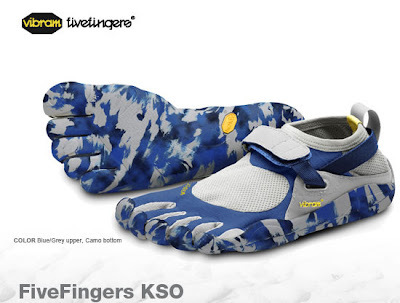 And also not forgetting the VFF KSO... looks good and fits for barefoot running! Its being wear by Mohan, regular Singapore runner who come to KL running over the weekend! This VVF KSO is not available in Malaysia, and nearest place is Singapore. Oh yeah... Runners Malaysia Potluck Anniversary will be held on 24 April 2010, 7.30am, Saturday, at Bukit Aman Car Park. 1 day before Bidor Half Marathon run!